Interactive people search offering basic information for free and more detailed information for purchase. 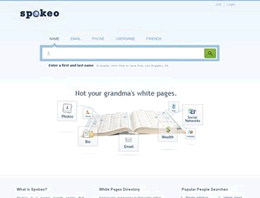 Spokeo searches the web and public records for pictures, bios, wealth, address information and more. It will return information that can help people find and connect more easily than traditional methods. Starts with a $4.95 charge that escalates quickly. Expect to pay upward to $30.00+ to find the information you want. Their disclosures are vague - beware. Use a prepay card if you are smart and expect to pay over 30 for one complete record. At the beginning it said it would only cost a few dollars and now after it was all done it cost between $20.00-$30.00 and what a rip off! I would NEVER recommend this website to anyone! I was forced to give them a star, otherwise they would get 0 stars. Shame on these people. You can do better with the White Pages. IVE USED THIS SERVICE FOR YEARS NOW WITH PLENTY SUCCESS. I WILL CONTINUE TO USE IT. THE NAY SAYERS PROBABLY BELIEVE THOSE VIRTUALLY FREE TRIPS TO LAS VEGAS ARE REALLY FREE. They tell you they have a name right up untill the time you purchase . Spokeo, as all people search sites, states "Free Search", which is true, there is no charge for the Search, there is always a charge to see the Results of the search. Read the wording carefully and don't assume more than what is stated. I have spent alot of money and had little results. Just charging more money. Worked great when I had a subscription however I was on auto renew and they failed to renew my subscription when I call to get it renewed they told me they no longer offer yearly renewals and tried to tell me it was a Credit Card issue. 10 of 29 people found this review helpful. I signed up for Spokeo a week ago to get an associate's phone number. Since then I have learned that the associates phone is for an unrelated business, that my phone is one that I gave up 15 years ago, and my brother is female. ZERO stars ! LIE ! NOT FREE ! tells you it's free than says "person found sign up and pay for information" dont use it ! Ain't anything but a scam you should'nt have to pay for your own information. This website should be talking down for good. Do not waste your money on this site. They mislead you by telling you that it costs $2.95, but then you are charged $35. When you tell then you did not wish to join and to please return your money, they say that they cannot because it was stated at the beginning that it is was not a "trial"; but a yearly subscription that cannot be refunded. The information is conflicting and not accurate at all. If you do not MAKE SURE TO TELL THEM, YOU WILL BE CHARGED NEXT YEAR. They claim to be free but will not disclose info without being paid. This site is a scam. It charges for information that you can find on many free sites. Sorry, sorry site. said it was free, but now you want to charge me..I will never pay. NOT FREE, pretends to be but then wants to charge you. Waste of time. Thanks for nothing. Had the complete profile for a couple of bucks, not bad. Simple to navigate, this helped for a pretty generic name. 12 of 31 people found this review helpful. I knew my old roommates name and hometown and that's all it took. We were on the phone reminiscing 10 minutes after I first clicked to the site. As far as campers go, I'm a happy one. 20 of 51 people found this review helpful. Jackpot. Was looking for my main gal Lonnie from first out of college job. This was pre-internet days so god forbid I didn't have her as a facebook friend. But we've gotten back in contact, very cool. Thanks. Its good, simple, has had 90% of what I've been looking for. Great value for the information. I haven't found anything better out there. Easy to use. And, if you decide to pay does not cost to much, very reasonable.